(This post contains affiliate links. I'd only recommend something I really believe in. In fact, this is the first time I've ever included an affiliate link in a post). 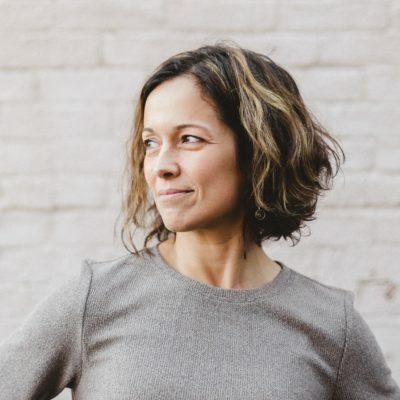 While I consider myself reasonably techy, having started my own podcast, made a serious friendship with Canva, and even gotten the hang of basic video creation, today's guest, Jennifer Gonzalez, takes it to a whole new level. I'm betting you already know about Jennifer's website, Cult of Pedagogy, and her podcast by the same name. It's an incredible source of information for teachers at all grade levels and in all disciplines. 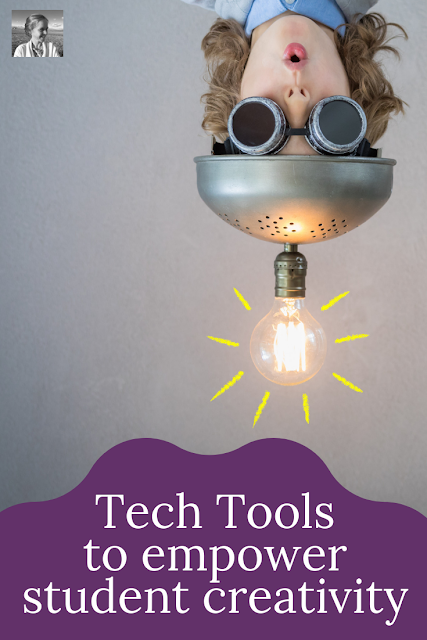 Each year she spends two months updating and revising her tech guide for teachers, then puts out a podcast featuring her favorite new tools for the year. She's even put together an online course for teachers interested in maximizing their creative use of technology in class, JumpStart. My legs fell asleep as I laid in bed last night, glued to the pages of her 2019 Teacher's Guide to Tech, finding thing after thing I had been wishing I could get my hands on as I clicked through its hundreds of colorful hyperlinked pages featuring virtually every useful tech tool available to teachers. An explanation for those little QR code squares I see everywhere and how I could actually use them in class? Yep. An explanation for how on earth these #Twitterchats I'm always hearing about actually work? Finally. Tools for helping students with their writing? There were actually six separate CATEGORIES full of tools for just this. More than just telling me what I've been wanting to know, the guide also told me about lots of things I didn't even know I wanted to know. Like how to use Noisli to create my own happy place wherever I'm working. Maybe I'm sitting by the cute paper snowman in the hall outside my daughter's preschool, trying to cram in ten minutes of work before I get to hug her. Now I can be playing coffee shop sounds with hints of a roaring fire in the fireplace and a light rain outside into my earbuds. I MEAN COME ON! How cool is that? So you can imagine I was excited to sit down with Jennifer and ask her to focus in especially on technology for creative ELA teachers. And it was just as much fun as I thought it would be. Get ready to learn about some great tools for you to use in class immediately, innovative ways schools are building learning spaces around tech, and how to get students started with curation projects and podcasting. This episode is FULL of ideas you can incorporate into your curriculum, no matter what you're teaching. I can't wait for you to hear it. You can read the full transcript here, listen below, or tune in on iTunes, Blubrry, or Stitcher. Read on for the written highlights. 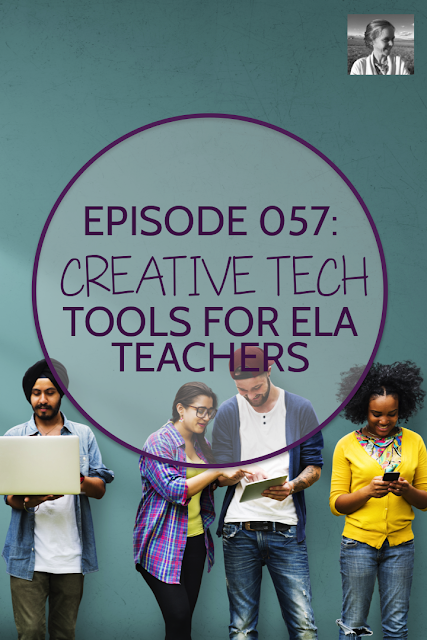 We started our conversation by focusing on some of the newest tools Jennifer discovered this year that would help creative ELA teachers. Equity Maps: This is a discussion tracker you can use to see who is participating and how. You plug in your students' names before the discussion and then observe and mark down what each student is contributing. "Whether it's to disagree with a classmate or to bring up a brand new point," said Jennifer, "or to build off of something that someone else is saying, or even if they're not there derailing the discussion completely or just being distracting, they mark all of that down and then they have this map of who participated, how much, what kind of quality contributions did they make, and so on. It's just a really neat idea in terms of - you know - figuring out how much your students are participating." Once the conversation is finished, you can all look together at the results. Everyone is bound to learn something about their own contributions. "I think it's really good to encourage students who aren't participating very much to show them how little they really did, and it also can work the other way for those who tend to dominate the conversation," said Jennifer. "It can show them how often they really were participating. It can also just help the teacher in terms of balancing out who they call on." Microsoft Translator: If you've got students in your classroom who speak very little English, this tool may be your new best friend. "It translates people's conversations while they're having them, and it's kind of amazing technology," said Jennifer. "It uses artificial intelligence to guess what you're saying. It's an app that you can put on your phone, and it works both ways. Students can ask you questions and it gives you a written transcript of what you're saying. I could be talking and I could maybe have a student come in from China, and they can program it so that while I'm talking, they're getting a written transcript of what I'm saying in Chinese." This tool can help language learners in partner discussions and small groups, as well as in conferences with you. Webjets: This is a mind-mapping / curation tool that will allow students to gather information, websites, videos, podcasts, images, and anything else they can find online into a virtual workspace. "This is like Padlet on steroids," said Jennifer, "because you can collect things on to this sort of bulletin board online. It can be links to websites, it can be videos, the videos will be embedded and playable right there on the board." The program is useful both for creatively teaching material and for giving students an option to present their ideas back to you. "I could see it being a really nice format for teachers who wanted to share a flip lesson or just a collection of things for students to look at and read," said Jennifer, "and it can also make a great format for the final submission of a project. If the student has a multimedia project that they were doing that had maybe a video component, maybe a podcast, maybe some images, and then also some text. You can even embed a working Google doc inside this board and actually go in and edit it right on the board. It's just really flexible and an interesting." Next up, I asked Jennifer to share a story from one of her many interviews and collaborations, of a school that is successfully using technology in a unique and inspiring way. She shared the story of one school in Ohio, that revisioned it's library from a space with only books, to a space filled with moveable furniture, freestanding whiteboards, and various movable tech tools students could use to collaborate on group projects. (Plus, the books are still there...) Almost like the Google Garage for high school. Now they call it the learning center. "In some ways this idea is very similar to the way we have always rented out iPad carts, Chromebook carts, computer labs," said Jennifer, "we reserve those, but it's all in this big space. There's a lot of other types of technology in there now that really get kids to collaborate now, instead of everybody just being on their own devices. They've even got a system to where teachers can just send small groups or individual students down to work on their own projects and take advantage of all of this technology that's in there. They've increased their student use by over a thousand percent, where they would maybe get nine kids a week would come in. Now it's one-hundred-fifty kids coming in." Curation is a relatively new type of classroom project. It involves students gathering a range of sources on a topic and putting them into a collection, with commentary on each aspect of the collection which shows why they've included it and perhaps analyzes it, depending on the assignment. "I feel like curation-- I'm kind of tired of the expression --- '21st-century skill,' but I really do feel like curation is one of the most important skills that we need to have right now with all of the information available to us. Teachers and students, all professionals really need to learn how to filter through all the information that's out there and collect stuff for a specific purpose, and then deliver it in a way that your audience, whoever that is, can consume it in an enjoyable way," said Jennifer. Jenn suggested elink as a particularly helpful option when it comes to curation. This tool will allow students to pull a web link and see the URL and picture from the site, then add their own text to explain its relevance to the project. It's a lot like making a Facebook post, so it's quite intuitive for most of our social-media attached teens. Example of an elink I created for Jenn's blog post about Curation. Jennifer had lots of fun suggestions to get us started thinking about how to use a curation project. "I think a teacher could do something that's like a literature review that people do in academic research where you talk about all that's come before this, and here's what this person says about that, here's what this person says, maybe here's an example of something that's not well researched. We're really bringing in the evaluation level of Bloom's taxonomy where students are judging something for quality as opposed to just saying, 'Here's the information that I got.' ...There's a lot of different ways that we could do this. We could do a ranked collection, for example. Maybe if we've been doing a lot of self-selected books throughout the school year, a nice end of year project would be for students to collect the top ten quotes from the books that they read that year, and they gather those up in some way. If we're doing a grammar type of an assignment, for example, they could be looking for some real-world examples of hyperbole." Aren't you excited to try this out? Perhaps since Jennifer and I are fellow podcasters, I felt we could have stayed on this subject for an entire show. There are so many fruitful ways you could use podcasting in class, once you get over the initial tech hurdles (that are really not so bad!). Let's start with some steps for getting students started effectively, and then look at a few different ways to use podcasting in class. 1. Begin by exposing students to a range of different appropriate podcasts. "I would not let them loose," said Jenn, "but let them see all the different kinds because there's so many that are really, really specific. There's just baseball podcasts, and there's just podcasts that are about a TV show. I think if students realize all the different kinds of topics they could actually do a podcast on, they would get really excited because there really is something for everyone." 2. From there it's time for students to think about what they'd be interested in talking about. "I think the harder thing about podcasting is figuring out what you want your content to be and then actually planning that out, and also getting over the idea of hearing your own voice recorded," said Jennifer. "It surprises me actually because I've got an online course for teachers called Jump Start. It's ten modules, and it's for tech integration in the classroom. The last module is just basic podcasting, and they have to make four audio recordings. A lot of people talk about struggling hearing their own voice." 3. Once students have an idea for a topic, it's time to think about the style of their show and their audience. Will they record on their own? Do interviews? Incorporate lots of research? At this point, they can map out maybe five short five minute shows. 4. Jennifer recommends cutting through the stress of trying to record in a sound editing program to begin. Simply have students record audio into one of their devices, or use something like the Google Chrome "Simple Audio Recorder." Once they have their series of audio files, they can pull them together on a Google Slide to present. 5. For students who want to take it further, Jennifer recommends using Garageband or Audacity to dive into the process of actually editing and mixing sound files, and then using the highly accessible platform, Anchor FM, to go live to the world. OK, so if you're really interested in diving into podcasting deeply with your students, here are some more ways (beyond a stand-alone podcast unit) you could build it into your curriculum. As an alternative to writing a research paper, you could let students record a research podcast. "One of the best podcasts I've listened to lately is called Teaching Hard History which is all about slavery," said Jennifer. "It's done by Teaching Tolerance. There is some academic depth to this podcast. It is definitely not people just sitting around shooting the breeze. For kids to listen to that and see how much research really goes into that, having a having a podcast or a podcast series would make a really nice option for kids who prefer to talk instead of write. Especially, if there is some really rigorous academic criteria that's going to be applied to the grading of it." If you're interested in trying a genius hour project with your students, in which they pursue a personal interest in class throughout the year, a podcast - like a blog or a Youtube channel - would make a great outlet for them to document their work. They'd be using their ELA skills to process what they are learning as they explore what truly interests them. This could make a great project for students even before (or after) diving into making their own podcasts. Let them look around for a series of podcast that fit a theme they are interested in, whether that's a certain niche topic or style. Maybe they'll share three podcasts about technology that are interview-style with well-mixed music. Or maybe they'll look at three popular teen podcasts with three different production styles and what makes each one work. I saved this question for last, because I wanted us to be inspired by all the options before we talked about the anxieties that can come up with tech. Luckily, Jennifer has a ton of good advice for helping us overcome those anxieties. Mindset: "If you go into it expecting that you're going to have problems, then that's actually a good thing, as opposed to going into it just crossing your fingers and praying that nothing goes wrong. Go into it with the attitude of, 'Okay, sooner or later something is probably not going to work, so I am going to ride that wave when it comes, and that's okay.' Just knowing ahead of time not everything goes right. With that in mind-- and I guess when I say that I don't mean that you're going into it pessimistic, you're going into it loose and realistic, like, 'Things could happen, and I'm going to be okay with that.'" Start Small: "Starting with something really small like, for example, when I'm talking about the podcast, don't try to have them do a full-fledged learn the audio editing and everything. Get a simple audio recorder, tell them you can re-record but you can't edit, it's like voicemail, and then don't mess with all that crazy difficult stuff. Just do the first step first and figure out the simplest way of handling it, and then you're going to get the bug and you're going to want to try something harder. Start with small projects that are low risk." Do Trial Runs: "If you're going to use a new app with your class, don't walk in first period and just start. I'd say two days before, get five kids to come in at lunch and try it with you first and see where are the bugs, what are the questions that the kids are going to have, what piece of it did I completely forget about that I need to remember. Do trial runs either with your very smallest class, or with a group of people after school, or just yourself. I sometimes, I'll have my own children try something out with me that I want to test because I'm not sure how it works or whatever. Most teachers have those couple of kids, or a nephew, or something where they can test something out before you're looking at losing a whole class period to something." Always have a Backup Plan: "Always know, 'What am I going to do if the internet goes out?' or if, 'This thing suddenly locks us all out we can't do this.' What is your analog plan? Is it to just do it on paper or to just not do this activity right now and move to something else. As ELA teachers, the kids have a book, just read your book. 'Everybody, just get out your independent reading book and that's what we're going to do while I figure this out.' It's good to have a backup plan so that you don't end up freaking out if it doesn't work." Well, I think you're ready! Time to go try out all these awesome ideas, and then share all the amazing results over in our Facebook group, Creative High School English. 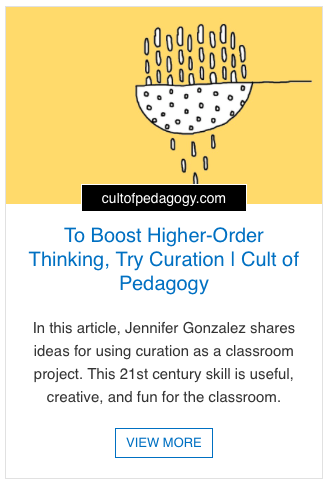 By visiting the website, Cult of Pedagogy, you can spring out to her podcast, blog, videos, and store. Check out her 2019 Teacher's Guide to Tech here. Learn more about her technology course for teachers, JumpStart, here. If you're a department chair or curriculum coach, check out the group licensing options. You could launch the course with a group of interested faculty at your school. I am an affiliate for Jennifer's Guide and course. I asked her if I could recommend them here, because I think it's awesome. As an affiliate, I receive a small commission if you purchase her guide or course through my links. So your purchase from this site helps support the work I do here at Spark Creativity. I would never affiliate for a product I didn't believe in. In fact, this is the very first affiliate product I've ever shared here on my site.